What is it exactly about Jane Austen’s Pride & Prejudice that makes it so timeless? That 200 years later, makes it enduring and still so very relevant? Simply this: because Pride & Prejudice is a story that frankly and humorously examines human nature and relationships in all its complexities– failings, faults, vices, motives, presumptions, misconceptions, pride, prejudice, selfishness, yet also forgiveness, humility, compromise, grace, love, friendship and selflessness. It’s a story that remains timeless, because human nature hasn’t changed. It’s enduring because most of us long for what Elizabeth and Darcy have found in each other – that someone who loves and respects us even when they’ve seen our soul at its ugliest, lowest point; that someone who truly understands us. It’s a story in which we catch glimpses of ourselves reflected back at us and in which we find truth, humor, self-realization alongside Austen’s characters. Maybe it’s the 200th anniversary, my new-found addiction to The Lizzie Bennet Diaries, or my long-standing crush on Colin Firth that was eternally cemented the first time I ever watched the BBC version (Episode four? Yeah, you get me. 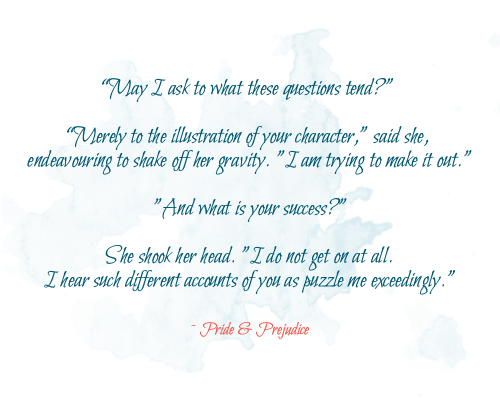 ), but I have been borderline obsessed with Pride & Prejudice as of late. More than usual, anyway. 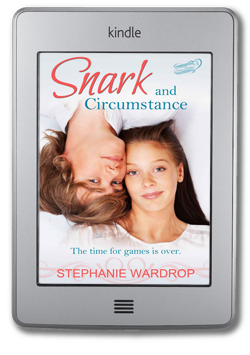 So when I found out that Stephanie Wardrop’s Snark & Circumstance is the latest, greatest retelling of this ever-so-wonderful story, I pretty much leapt at the chance to read it. And it did not disappoint; this novella is great fun. A looser retelling of the original that is set against the backdrop of high school, Wardrop does an amazing job of capturing that same overall vibe of the original story while inserting her own creative touches along with, as the title would indicate, a fantastically funny injection of snarky humor. It feels familiar, while still being brand new. And it’s great fun discovering just how Wardrop has re-imagined the details, big and small, and inserted them into Georgia’s world; such as how she’s restructured the dynamics of Georgia’s family or how she’s maneuvered the circumstances in which certain people are introduced into the Barrett’s lives. Georgia Barrett plays the part of our beloved Lizzie. Having moved to the small, elitest New England town of Longbourne a year ago and leaving her life in Boulder, CO far behind, Georgia has made very little effort to fit in in her new home. Opinionated, outspoken, intelligent, zealous and passionate, Georgia doesn’t have patience for the pretentious snobbishness of her peers whom she views as overly-privileged, self-absorbed and shallow slaves to social status. They’re nothing like her – the well-read, animal-loving, free-thinking vegan who actually has two halves of a brain to rub together AND who actually realizes the boundaries of the world stretch far beyond the walls of Longbourne High School. However, having promised her worrier of a mother she’d try to make more of an effort socially, Georgia begins to wonder if perhaps she’s painted her town and the people in it with too broad of a prejudicial brushstroke. Though Georgia is so very flawed, so self-righteous, snarky and judgmental, she demonstrates time and time again that she’s only human, and ultimately this is what draws me to both Georgia and this timeless story time and again. Georgia’s likable, relatable, and so very funny, while also being prickly, caustic and “willfully misunderstanding” those she doesn’t wish to understand. Georgia’s promise to her mother seemed like a good idea at the time, but is made all the more difficult by the appearance of Michael Endicott who’s planted himself center aisle, second row from the front in her life… or at least in her classes. Michael Endicott of the Longbourne Endicott’s, the town founders, has – for reasons unknown – found himself kicked out of his elite private school, Pemberly, and is now slumming it in public school. He wastes no time whatsoever, in demonstrating to Georgia just what a “pompous snobhole” he is (no matter how handsome or intriguing he might be), and the two quickly find themselves at odds. The point at which this retelling differs the most perhaps, is that there seems to be more interaction between Michael & Georgia. Since they have to see each other for three classes a day, five days a week, and they are partnered up for projects in two of those, they get more interaction than Lizzie & Darcy ever did and therefore it’s in Georgia & Michael’s best interest to find a civil way to make their partnership work. If not because they are both reasonable human beings (which Georgia views as highly questionable and most likely improbable), then because their grade depends upon it. I really enjoyed this aspect of Snark and Circumstance – the everyday interaction between the two. And in this vein, I think it’s interesting to note that while both Michael and Georgia don’t see eye to eye on pretty much anything, there doesn’t seem to be quite the vitriol between them that’s there in the original, though there’s certainly a fair amount of snarky judgment going on. And the chemistry between these two? The banter? It’s by far the highlight of Snark and Circumstance. Now, this novella is only the first in a series of novellas that will tell Georgia and Michael’s story, so who knows what’s going to happen. I anticipate lots of drama, more propensity for hating everyone, more moments of willfully misunderstanding people, moments of palpable chemistry, massive amounts of snark… and I can’t wait! Overall, a creative, funny, snark-filled retelling that captures the vital essence of Austen’s original, Stephanie Wardrop’s Snark and Circumstance is a must read for fans of Pride & Prejudice.